The Eclipse residential elevator is a smooth-riding elevator that takes up less space in the home and takes less time to install. Save valuable space in your home with the Savaria Eclipse residential elevator, which doesn’t require a separate machine room. With simpler construction requirements, the Eclipse is easier and faster to install in an existing home than a hydraulic elevator. 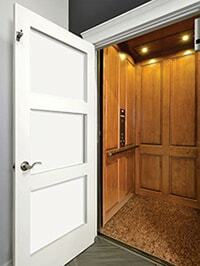 Your local dealer can show you the many ways to make your Eclipse home elevator the perfect complement to your home. A variety of finishes and fixtures are available to suit virtually any décor. If you think a residential elevator will allow you to remain safe and independent in your own home, set up a free in-home evaluation and demonstration. We will provide a no-obligation quote. Our installation staff is factory-direct trained and licensed by the State Department of Consumer Protection and the State of Rhode Island Department of Labor. There’s no sales nonsense – just plain facts and great pricing.